Like a lot of people, Steve moved to Utah in 1974 for the skiing. His love for fly-fishing soon got the better of him and, in 1984, he took a job with Anglers Inn. 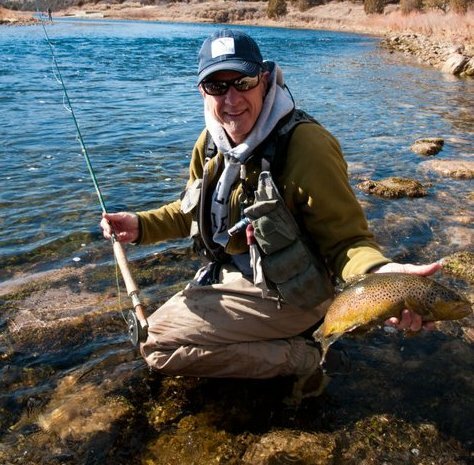 His desire to share his passion with other fly- fishers and those who wished to learn about the sport, led him to open Western Rivers in 1986.
to protect the lower Provo river from a bad highway expansion project and hasn’t stopped yet. Steve expanded his conservation efforts in the last few years to include protecting the angler’s right to use these resources. He has been an integral part of the ‘Stream Access’ battle in Utah. His efforts working with USAC, lobbying legislators and working with all parties to protect our right to recreate on our waterways, culminated with him being the key witness in the USAC lawsuit to get HB 141 overturned. While we might not know what the outcome of these efforts are yet, you can be certain that no matter what the result is, it won’t be for any lack of effort on Steve’s part. Steve Schmidt is owner and chief bottle washer at Western Rivers Flyfisher. Since opening Western Rivers Flyfisher, he has traveled the world sampling an amazing array of fly-fishing waters. Although Steve is comfortable with many tools of the trade in many environments where we are fortunate to fish a fly he is most at home swinging a grease lined fly, fishing one of his favorite western spring creeks or fishing the emerald waters of the Florida Keys. His passion for the fly-fishing industry, and the sport were recognized in 2007 when Western Rivers Flyfisher was awarded “Fly-fishing Retailer of the Year”. After two decades, he still loves his customers, the business and can think of few things that he would rather do then cast a fly.